Looking for an exciting program for students and families? Go Green Night offers two hours of family fun, exploring, and learning about how we can make our world a better place to live. This event features ten (or more!) 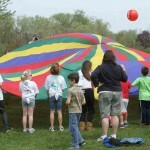 hands-on family fun activities, including games, races, experiments and team challenges. Target age: K-12th grades. Activities determined by grade level. The Base Cost is $800. Two hours of family fun, exploring and learning about how we can make our world a better place to live. Ten or more hands-on family fun Activities, including games, races, experiments and team challenges. Activities appropriate for K-5th grade (can be adjusted for other ages). Activity kits that include all materials and instruction guides. Each Activity includes a “take-away” message to help families understand how their choices make a difference to the environment. Go Green Night passports to guide people through the Activities. Set-up and volunteer training for all activities. Support before, after, and throughout the Event. PTA or teacher contact to assist with coordinating Event. Adult or teen volunteers to run the activity stations (approximately 20). 15 long tables set up 2 hours prior to Event. Access to 3 electrical outlets. 5-10 “Go Green” prizes to be used at Passport Raffle Drawing at conclusion of Event (optional).